The U.S. out ranks the UK, Canada, Australia and others all by a long shot when it comes to the number of operating web hosting companies. 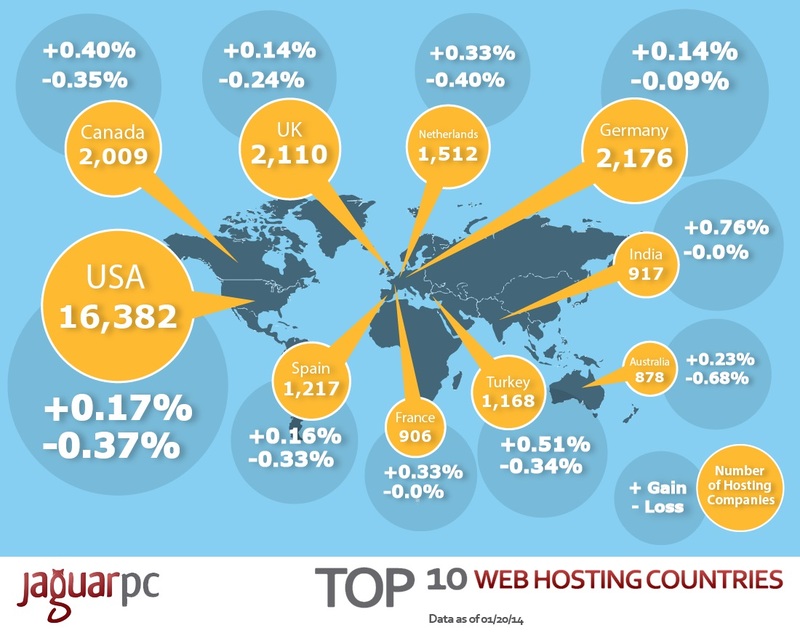 41.2% of websites worldwide are hosted by U.S. web hosting companies with Europe accounting for 31.4% and Asia far behind with only 11.5% of the market share. Hosting your website with an U.S. based web host gives you the advantage of years of experience and high quality server technology to compliment the fact that your site gets served faster to the clients that are closest to you. U.S A. based web hosting markets are continuing to grow because more and more brick and mortar business are moving into the online sector where they can reach more consumers with their products and services. The American web hosting market also offer a more economical choice for those wanting to host their websites. Affordable web hosting plans from American based hosts will often include value added features such as SSL certificates, daily backups, cPanel along with 24/7/365 live support options which providers out of the country can’t offer due to costs. Hosting your website with a U.S. based hosting company provides benefits that will allow your site to be more successful, affordable and able to reach more visitors more quickly than options outside of the American market. Choose JaguarPC.com as your hosting provider for affordable and reliable web hosting services.